iPad is one of the hottest digital products in recent years, people love it for it is really powerful and easy to carry. Indeed, you can use this device to carry all digital entertainment from computer to iPad. For example, it offers you great convenience to browse webpages, chat online, listen to music, watch videos and many other more. Since the display of iPad is clear and sleek, more and more people love using it to watch HD videos. And for discovering infinite high definition video resources, Vimeo should be the first place to visit. All in all, it is a nice choice to watch Vimeo on iPad. 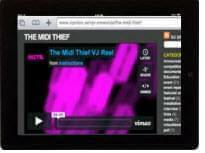 In order to improve viewing experience, Vimeo released HTML5 player for iPad users in 2010. This player has some advantages over the traditional Adobe Flash player and enables to play most of Vimeo videos smoothly on any web browsers. 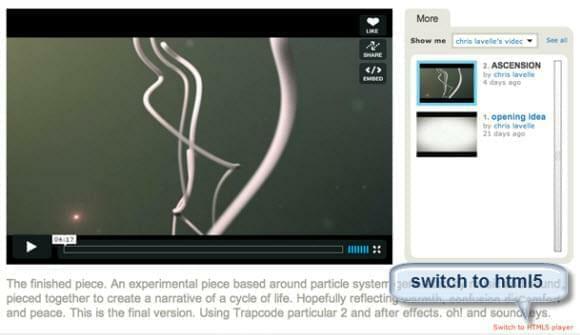 To watch Vimeo video in HTML5 player, open a video webpage, clicking the “Switch to HTML5” button under the video playing window. The player will respond and load instantly. And then the video will start to play, you don’t have to waste time and wait for the video buffering. Just enjoy the video or cut to the certain parts that you wish to watch. In this case, you can play Vimeo on iPad more easily. However, this new player also has some demerits that require to be optimized. Firstly, Vimeo doesn’t support full screen watch mode on iPad. Another issue is that the Vimeo videos embedded on the pages of a site other than Vimeo are not working on iPad. And the biggest question is, no matter in Vimeo community or other forums, people report and complain that some Vimeo videos cannot be played successfully all the time. Vimeo kept on testing and repairing, but a perfect solution still hasn’t be found. It is deniable that HTML5 technology is not that mature and needs to be reformed. 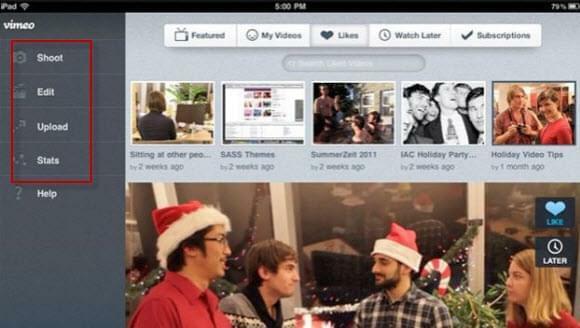 Follow the popular trend, Vimeo developed special application for iPad. To use it, you can find and download it in iTunes store. The app updates frequently, so the feature is optimizing all the time. After you install it on iPad, you can play Vimeo videos easier. Except of playing videos, the app also provides other functions. Firstly, it supports Airdrop which allows you to share videos to nearby friends. Secondly, it adds the “Watch Later” function. You can store the videos and watch them later even without connecting to Wi-Fi. Thirdly, the latest version features video thumbnail which enables you to preview video when you scroll the video progress bar. The Vimeo app for iPad is so powerful, but drawbacks still exist. The biggest problem is the search function is disappearing. Thus, it is not convenient to locate the video you want. Then, some users said that it turns black screen when playing Vimeo on iPad sometimes. In order to watch all the Vimeo videos on iPad, how about trying to download videos from the site? If we can save the streaming video into local file, we don’t have to rely on network and HTML5 player. Just open the media folder and view the Vimeo videos on iPad at anytime and anywhere. To download Vimeo video to iPad, you can utilize the two ways below. It is known to us that Vimeo is the video-sharing site, but it also offers video download service at times. The fact is, video uploaders have the right to enable download feature and permit viewers to save their videos. If the video is opened for downloading, you will see a “Download” button under the video player. Click it, then a small menu shows up and ask you to choose the preferred video quality and format. 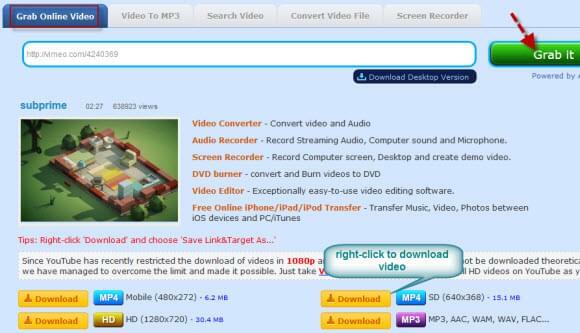 The size for downloaded video is also displayed there, select one according to your requirement. And the last thing is to set the output directory for storing videos, waiting for the video download. Several minutes later, you can check the hard drive disk and play Vimeo videos on iPad conveniently. As we discussed in the last part, Vimeo videos can only be downloaded from the site within the permissions of authors. 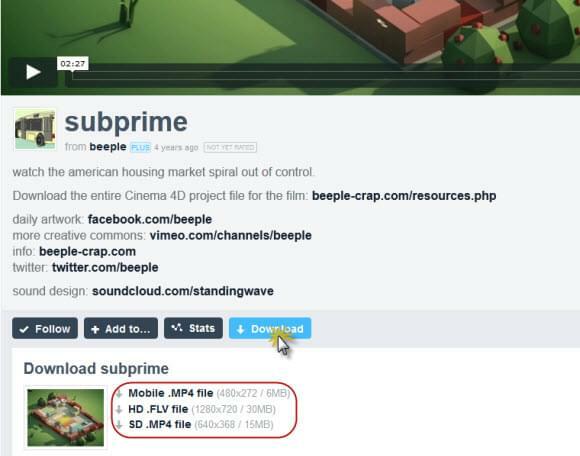 Thus, for downloading all videos, a 100% workable Vimeo downloader is indispensable. Among a variety of apps, I would like to recommend Video Grabber for it is effective and easy to handle. Only in several steps, the video will be saved to your iPad. Open videograbber.net, tap “Grab Online Videos”. Then, find your favorite video on Vimeo, copy the URL on the page. Back to Video Grabber, enter the URL to download box, hit “Grab it” button. The available formats for downloading are listed there. Select one format and begin to download video. 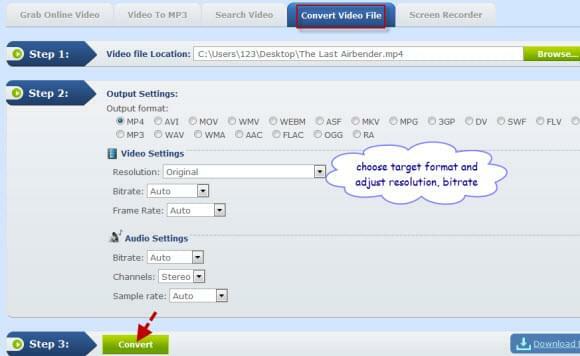 On function bar, click “Convert Video File”. Browse the folder and search for the video that needs to be converted. Next, set the right format for conversion. MP4 and MOV are suggested for these formats are compatible with iPad device. Launch iTunes and add videos to the library, update the data. Connect iPad with computer to sync iTunes library. When sync completes, open the folder, find videos and watch Vimeo on iPad. This is the complete tutorial about playing videos on Vimeo with iPad. Hope you can get helpful information here. Nice tutorial. Video Grabber really works for downloading Vimeo videos, but download videos one by one is not that efficient. Any suggestions?